I grew up in a very small town, a town where farming, fishing, and hunting were mainstays of the local lifestyle. One of the crops grown in the area was cucumbers (or, as I've always called them... pickles! ), and those cucumbers got made into dill pickles in the very same town. These pickles still remain my favorite pickles ever. I grew up on them, and even love to drink the pickle juice from the jar when the pickles are gone. (Gross I know, but SO delicious!!!!) 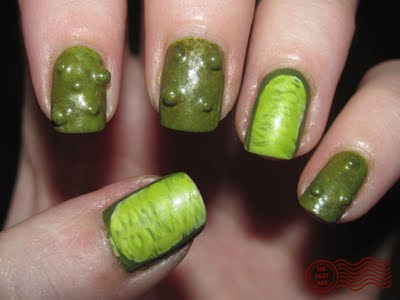 Anyway, as an homage to the vinegar soaked bites of awesomeness, I did pickle nails! To achieve the pickle bumps, I used nail pearls from Born Pretty, then painted over them, and to get the mottled look of the pickle skin, I sponged several different greens. I used butter LONDON Dosh as a base for all nails, and over top of the nail pearls on the bumpy nails. On the bumpy nails, I used Dare 2 Wear Rio De Janeiro, Icing True Beauty, and RBL No More War, and MAC Dry Martini to sponge over butter LONDON Dosh. For the pickle inside nails (thumb and ring) I used Dare 2 Wear Rio De Janeiro over the base color, then mixed with American Apparel California Trooper and some Icing True Beauty to make the highlights and shadows of the seeds. Topped everything off with 2 coats of Seche Vite top coat.